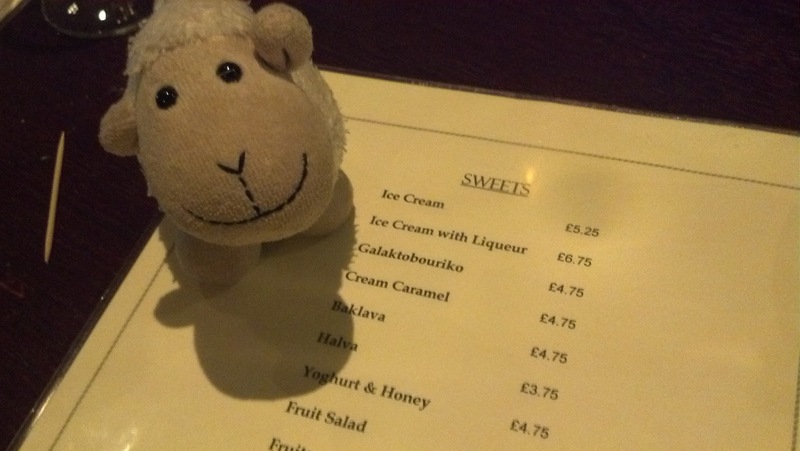 On our first trip to London, we stayed near Santorini Taverna, a wonderful Greek restaurant. 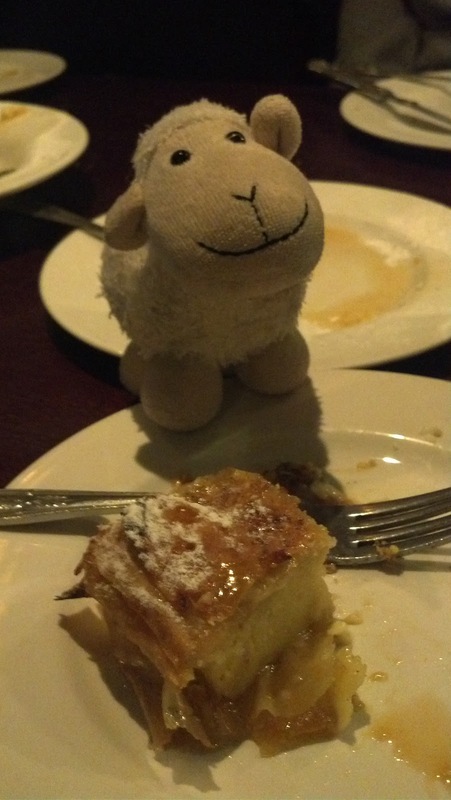 We ate there several times in our ten day stay, and have been back both times we visited London since then. Our very first dessert was a Galactic Burrito. Or at least that is what I heard. And it was amazing! 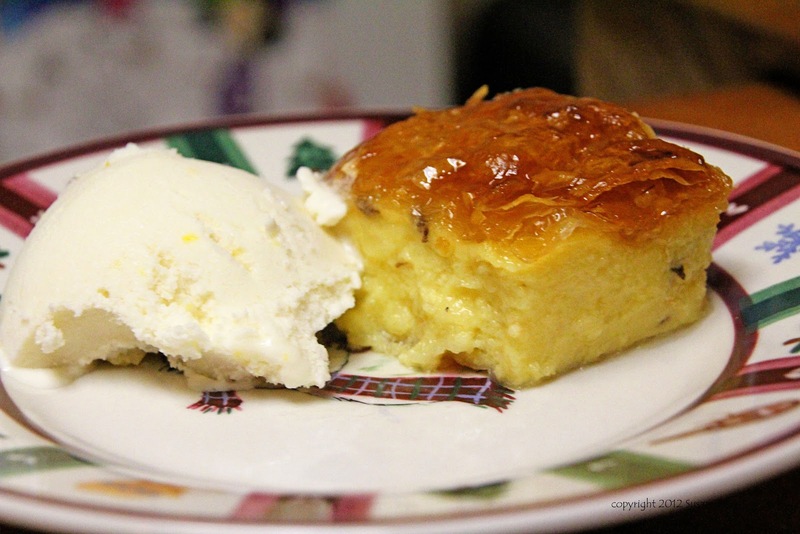 I have since found that the actual name is Galaktoboureko (gah-lahk-toh-BOO-reh-koh) and is a divine combination of creamy custard and flaky phyllo dough that is baked to golden perfection then drenched with a lemon and orange infused syrup. We had a Greek-themed Christmas Eve dinner, and I knew that I had to make it. This dish has a lot of steps, but is actually pretty easy to make. I was galactially (ha!) busy and neglected to get any pictures of the preparation, but if you follow the recipe, you'll have a fabulous dessert. In a large saucepan, heat the milk over medium high heat until just boiling. Add the semolina and stir with a whisk. Lower the heat to medium low. Using a whisk, beat the egg yolks with the sugar. Ladle a cup of the warmed milk into the egg mixture to temper and then add the egg yolk mixture to the pot. Continue to cook over medium low heat until the cream starts to thicken, stirring continuously. When the custard has thickened, remove from heat and stir in the vanilla extract and the butter. Set aside. Carefully remove the Phyllo roll from the plastic sleeve. Most packages come in 12 x 18 inch sheets when opened fully. Using a scissor or sharp knife, cut the sheets in half to make two stacks of 9x12 inch sheets. To prevent drying, cover one stack with wax paper and a damp paper towel while working with the other. Using a pastry brush, brush the bottom and sides of a 9 x 12 rectangular pan. 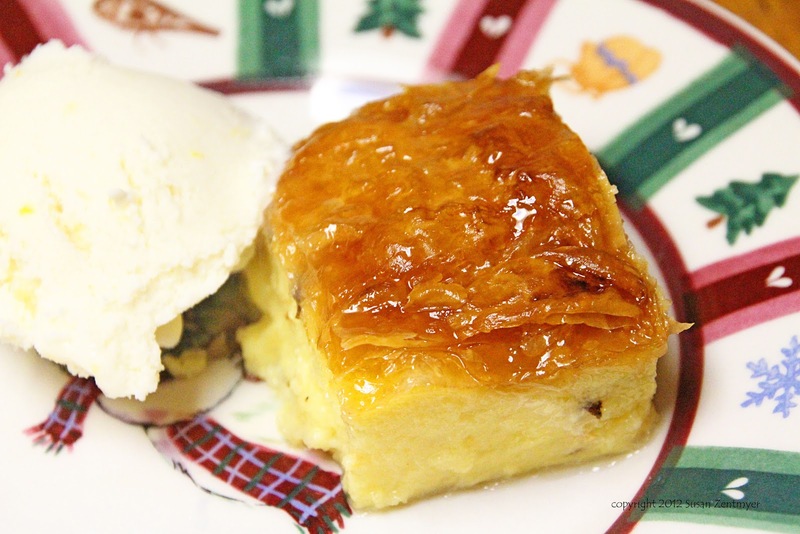 You will use approximately half the phyllo sheets for the bottom of the pastry. Begin by layering sheets one by one in the bottom of the pan, making sure to brush each one thoroughly with melted butter. When you have almost layered half the sheets, drape two sheets of phyllo so that they extend half in the pan and half out of the pan horizontally. Add the custard in an even layer on top of the sheets, smoothing the surface with a spatula. Fold the phyllo sheet flaps in over the custard layer. Add the remaining sheets on top, brushing each sheet with melted butter. Before baking, score the top layer of phyllo (making sure not to puncture the filling layer) to enable easier cutting of pieces later. Bake in a preheated oven for 45 minutes or until the phyllo turns a deep golden color. Combine the sugar and water in a saucepan and add the lemon peel and orange peel. Boil over medium high heat for approximately 10 – 15 minutes. Remove the lemon and orange peel and stir in the lemon juice. Do not pour hot syrup over the hot custard. Allow both to cool to room temperature and then carefully ladle the syrup over the galaktoboureko and allow time for it to be absorbed. Slice and serve - I served with Coconut Lemon Ice Cream - yum! I'll share the ice cream recipe tomorrow. Be sure to come back - you won't want to miss it! It has been YEARS since I have made this . . close to 30, if I were to guess. But I still remember waiting for it to thicken . . reminded me of oatmeal thickening. It is, as you said, one of the BEST tastes in the world . . and a lot easier to make than the recipe sounds.